cost-effective control of Audio, Video, Lighting, Security, Climate, and more. of developers and interface experts deliver consistent, reliable results. A module for this. An App for that. Designed and built by Custom A-V and Automation Experts. NEW for AMX and Crestron. Complete App-Module for controlling a Denon HEOS system via TCP/IP. 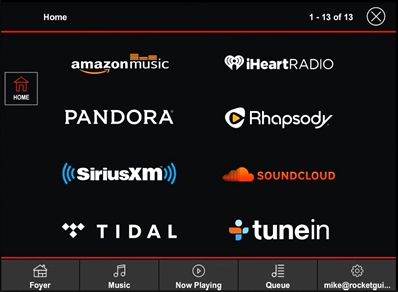 Browse and play music from your own collection plus eight HEOS supported streaming services including Pandora, Rhapsody, TuneIn, SiriusXM, iHeart Radio and more! A powerful array of pre-programmed tools for use in any AMX control system. Send notifications to clients & tech’s, create and receive data logs, simplify trouble-shooting, receive IP change notifications, and much more. Whether you’re just a little behind, in a bind, or just plain ready to pull your hair out... the professional UI designers and programmers at RocketGUI can help get your project back on track. We specialize in tackling unique control system challenges as well as meeting tight deadlines. Maybe your project is behind schedule and you just need some help meeting your deadline. Or maybe that programmer you hired isn’t everything he was cracked-up to be. Whatever the reason, don’t lose any more sleep. Whether your project is a single-room home theater system or 20 integrated classrooms at the local university, our team of expert Control System UI and programming specialists have the experience and knowledge to get your project back on track. Give us a call or fill out the Quick Response Inquiry form below. We'll evaluate your situation and quote you a competitive price to make things right. Is a Remote Connection to the system available? Control System Rescue will evaluate your project status and provide an estimate, typically the same day. A 50% deposit of the estimated amount is required to begin work, with the balance due immediately on completion and delivery of files. Customer agrees to a 2 hour minimum charge for each support instance. Other terms and conditions may apply. 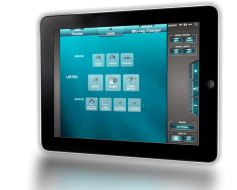 Includes pre-built Smart-Graphics VTP interface file for touch panels and tablets. 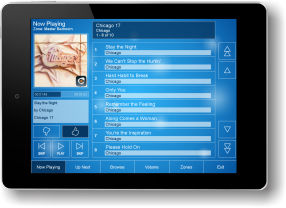 Easily integrates with your existing touch panel files. 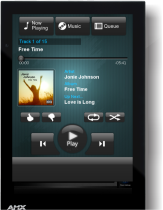 Browse and play music from your local music collection on a network drive, NAS and/or USB thumb drive. Smart Graphics VTP file resizes easily to fit many touch panel sizes and resolutions. 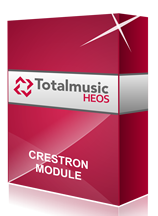 Module supports Crestron 3-Series processors. Supports any number of control interfaces in a project / installation. Easily integrates with your project code and TP files. Includes 30 days of free module integration support. * Some streaming services may require a subscription fee and some services may limit the number of concurrent streams. Check with the device manufacturer for restrictions and limitations. Supported services are subject to change by manufacturer at any time. on a single Crestron control processor. We’re a small team of professional software developers and interface designers with hundreds of projects under our belt and a proven track record of being responsive to our clients needs and exceeding expectations. Our small size allows us to be focused and agile, and ready to take on any challenge. RocketGUI is located in Spokane, Washington but we service clients across the country and beyond. Thank you for your interest in RocketGUI and for subscribing to the RocketGUI e-newsletter. distribute your e-mail address or contact information in any form. Bachelors degree or better in Software Development or related discipline, or equivalent directly related experience. Description: RocketGUI is seeking a full-time developer with demonstrated experience writing software for Crestron and AMX control systems to automate and control high-end homes, corporate boardrooms, smart classrooms, military command/control and more. Crestron and AMX developer certifications a plus. Skills and experience building custom user interfaces and utilizing related design tools also a plus. Knowledge of the AV industry and related components and communications protocols is required. Salary commensurate with experience level. 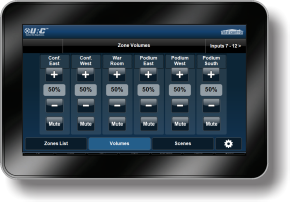 Demonstrated proficiency writing software for Crestron and AMX control systems. 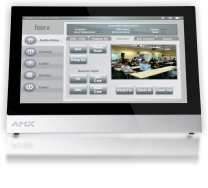 Demonstrated proficiency utilizing Crestron and AMX programming environments and related development tools. Like RocketGUI on FB and all kinds of good fortune could come your way. Or at least you can stay apprised of what we have going on. Thank you for visiting rocketgui.com. On January 1, 2019 we changed our brand name to Codespeed. Such a significant change is not made without deep thought and consideration, but we created the Codespeed brand to better serve the breadth of our product offering and our long-term vision and marketing goals. Please rest assured that our commitment to providing the best custom software, web, and app development services to our valued clients and partners will never change. Do you still provide programming services to the CE / Automation market? Yes, we do and will continue providing programming services to the custom A/V and automation-technology industries, including AMX and Crestron platforms.